We will be closed July 3rd - July 11th. There is a Beekeeping special report by the StarTribune in Sundays paper and on their web site. It is a four part series. I read the first part and took the time to look at all the pictures and the graphics. I thought they did a tremendous informative article. The plight of two migratory beekeepers, highlighting the struggle the two beekeepers have to make it in today's agriculture. I encourage all beekeepers to read the series. Please take time to comment on the article. The more comments may help bring this story into the national news. There seems to be a nectar flow all over the twin cities. Flowers have been opening at a fast clip. The many varieties are everywhere. Staghorn Sumac, Birdsfoot Trefoil, Alfalfa, Vetch, Yellow Sweet Clover. Today I saw some white sweet clover blooming. This is one of our major nectar plants. I have heard reports of wide spread nectar flows with bees moving up into the supers and packing away the nectar. This flow may be a bin buster. Keep putting supers on two at a time. Bees have a hoarding instinct. The more space they have in front of them, the harder they work to fill it up. We are sold of queens for 2014. If you need supers get them soon. Don't wait until the last minute. I was out putting supers on yesterday. I was looking at my colonies. Many of the them had nectar coming in. How can I tell? The frames are filling up with nectar. I am not feeding. The new wax being added is white and new looking. A closer look at this picture( double click on it). There is some darker burr comb. The edges of this dark comb has a white edge to it. The comb on the top bars is fuller and white with new wax. Definitely a nectar flow is on in Stillwater. New beekeepers that are still drawing comb and feeding, will notice the bees may not be taking the feed very well. The bees prefer nectar to sugar water. I would leave the feeder on until it is gone or the supers go on. If the top box fills with honey before a reversal gets done. Don't do a reversal, the full box of honey is going to be the bees winter stores. Now some sunny warm weather and the boxes should start filling up. Supers go on two at a time and check them once a week. The bees can draw out, fill and cap a super in a week. So stay ahead of the bees. Better to put the supers on sooner than later. I was in St Paul today and saw Catalpa trees in full bloom. Usually the blooming of Catalpa trees coincide with the start of the nectar flow. Beekeepers should put honey supers on now. Honey supers go on two at a time. If there is foundation to draw out on new supers they should be place directly above the brood nest. I use queen excluders under my supers. When I have new foundation in the supers, I hold off on putting on queen excluders until there is new wax and some nectar in the cells of the super. Then I put the queen excluder in. The next week will be warm, humid and rainy. This combination of heat and rain will make many hives crowded and will kick the swarming instinct into high gear. Beekeepers need to be on a strict 7-10 day schedule looking for swarm cells. Over wintered colonies and package bee colonies are all possible swarms waiting to happen. If the bees swarm there will probably will be no excess honey in that hive. Cutting out swarm cells before they are capped is imperative to keep the bees at home. A hive that has swarmed has very little brood in the hive. It usually has swarm cells that have opened. The new queen has emerged. The hive will be filling the brood frames with honey. 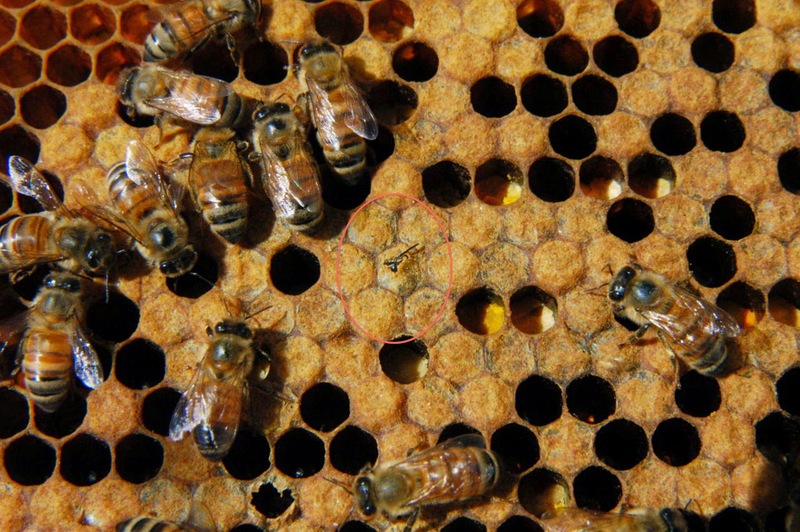 A new queen if it was mated will start laying eggs three weeks after it has emerged from the queen cell. These are emergency swarm cells or supercedure cells. They are normally located anywhere on the side of a brood frame. 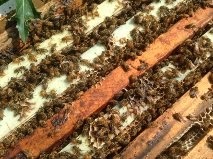 Swarm cells are usually on the bottom of the frame but can be on the top bars or on the edge of any comb. Hives continue to build and expand. Most package bees have finished drawing comb in their second box. Many beekeepers run three deeps and the beekeepers have added their third deep. The third deep will be drawn out in about 10 days after it is put on. Hive populations are exploding now with many frames of capped brood emerging. If you are drawing foundation in the brood box continue to feed. 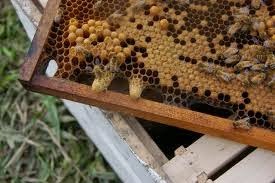 If the bees are done drawing comb in your brood boxes do a reversal. Top box to the bottom, bottom box to the top. This gets pollen stored in the bottom to the top. the bees will fill this box with honey for their winter stores. When the bees uncap this honey in February there will be pollen available to raise brood. If the bees are done drawing deeps, honey supers should be put on. 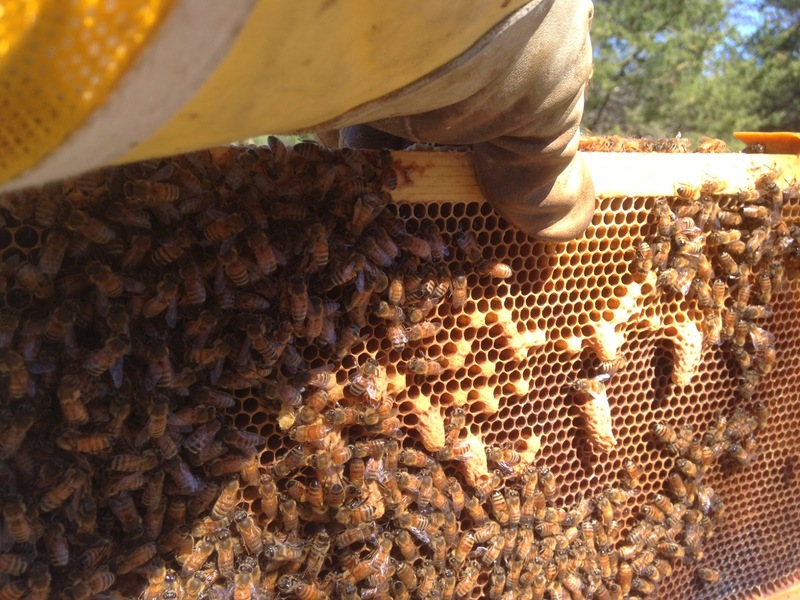 If the supers are new foundation it usually works best to leave the queen excluder off until the bees get a little comb and nectar going on one of the frames. Then put the queen excluder on. Whenever putting on new undrawn super frames on a hive always put them right on top of the brood nest. 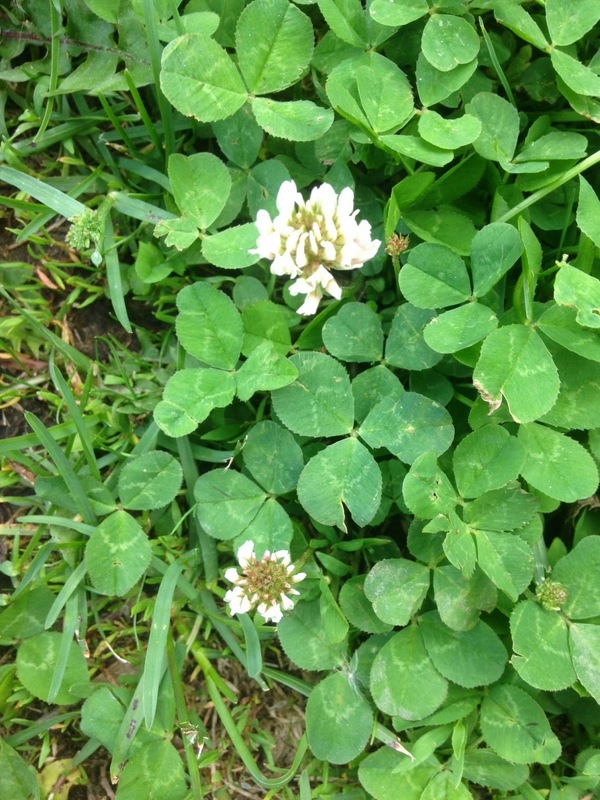 I did see some Clover blooming in my yard. The old adage is that the nectar flow starts 10 days after seeing the first clover bloom. So get ready. 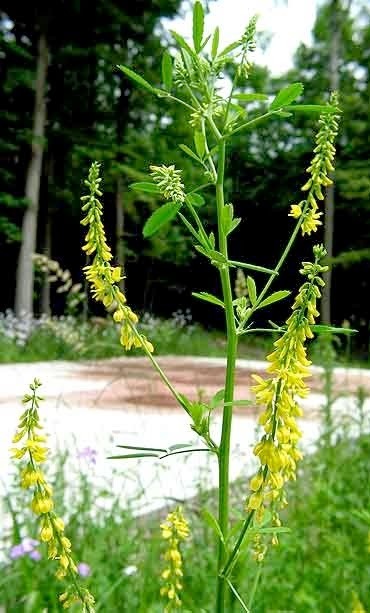 As Dr Fugala said " You can't make any honey if your supers are in your garage"
I was driving along 694 tonight and noticed the ditches exploding with blooming yellow sweet clover. Yellow sweet clover doesn't seem to produce a large honey crop in this part of the state. While in the western part of the state and the Dakotas, yellow sweet clover is THE honey crop. Producing huge crops of honey. Many beekeepers in the Dakotas are disappointed if they don't get over two hundred pounds per colony. Our major nectar flower is white sweet clover, which should be coming soon. Black Locust trees are in full bloom across the metro area. This can be a very good flow if you are lucky to have these trees in your area. The honey is very light. 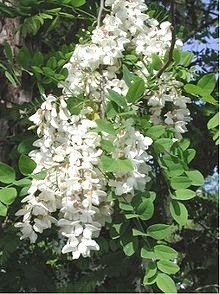 Black Locust trees have large amounts of showy flowers. The warm weather has been a welcome change from our cold spring. The warmer weather has made it easy for the bees to expand their brood nest. Right now everyone who has put in package bees should have put on their second boxes by now. I have heard that many beekeepers who were on the first delivery have hives becoming very populated with bees. Overwintered colonies have been starting to swarm. Many of these colonies have exploding populations and need to be divided if they haven't been divided yet. If the beekeeper doesn't divide the colonies, they will divide themselves and the beekeepers honey crop for this year will be in a tree in a swarm cluster. Weekly checks of swarm cells is a must this year. The nectar flow will be delayed about 10 - 14 days. That puts the nectar flow starting around July 1st - July 5th. Hives will be very crowded by that time and swarming will become a problem even in package bees. If the nectar flow is decent this season I think package bees will be able to produce a super or two of honey. At the moment the fruit bloom is winding down, dandelions are going to seed, and trees have bloomed and have leafed out. The current nectar flow is going away. The next nectar flow is Black Locust tree. This flow will happen in the next 10 days or so. The first Alfalfa crop should also be blooming in the same time period. I have not seen any hay being cut yet but that should be coming soon. For many of the local beekeepers there may be a dearth in pollen for the next three weeks. It is a good idea for beekeepers to put on pollen patties during their next visit to the hive.